Have a look at last years list of predictions of what would be hot for 2009. How did we do? Professional PowerPoint Templates for easy, professional presentations. Separate proposals introduced late last week would increase the maximum loan amounts for Small Business Administration-backed loans and extend fee eliminations and government loan guarantees. Republican Senator Olympia Snowe of Maine and Democratic Senator Mary Landrieu of Louisiana, members of the Senate Committee on Small Business and Entrepreneurship, introduced one proposal that would extend some of the provisions of the stimulus package. I think I am about 5 for 500 when it comes to successful ideas vs flops. I just watched a documentary about my neighbor Warren Buffett and he talked about how you should brag about your failures and be humble about your successes. I think my new years resolution in 2007 is to be way more humble. Do not think I have some golden touch or something that everything works out great… its just the law of averages.. try enough stuff and something will stick. Anyway I came up in about 10 minutes my top 10 worst ideas to make money that totally were a waste of time and effort (and money in some cases). Add Christmas Elements to your website! 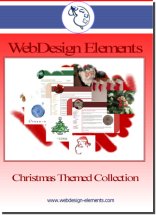 The Christmas Web Design Elements CD ROM contains high quality web HTML web layouts, graphics, and high quality stock photographs all available for use royalty free. Purchase the CD and use the images for building your corporate identity or brand. Perfect web and graphic collection for Christmas celebrations or Christmas related businesses. Search Engine Optimization has become a fine science. Tweaking, changing, and measuring is all part of the ongoing optimization process. SEO truly is a process that requires constant monitoring and attention. In order for a website to perform well, its managers and webmasters must adapt their SEO techniques as the search engine algorithms change. This year, there are more online bargains than ever on Cyber Monday-- with nearly nine out of ten retailers offering special online promotions for Monday, November 30th, according to the National Retail Federation. The day marks the traditional kick off to the online holiday shopping season. And to give you an idea of sales figures, keep this in mind: last year, more than eight hundred million dollars worth of merchandise was sold on Cyber Monday alone. Businesses can use Twitter as a marketing tool in a variety of ways. Many business owners struggle with social media as a marketing medium. At the heart of the most effective social media marketing campaigns is personal communication. Many businesses that try to manage social media may attempt to shout their message, rather than simply engaging with potential customers. Potential customers who are active in social networks will not be receptive to marketing in this fashion. The trick with social media like Twitter is to interact and engage, rather than shouting your message.